Send us your school supply lists. We will send you a price quote based on your customized items. You approve the contents and pricing of the packs and establish a fundraising fee to be added onto each packet. Promote your sale with our free marketing tools such as handouts, e-mail blasts, signs and posters. Parents order school supply packets online at our website. You establish when you would like the packets delivered to your school free of charge. If you choose the fundraiser option, you will receive payment when the program is completed. PLEASE NOTE THAT ALL CONTRACTS MUST BE SIGNED AND RETURNED BY 11/1/2018. 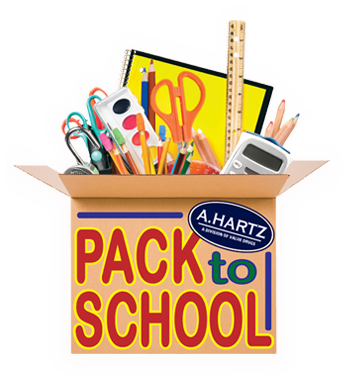 Early February 2019: A.Hartz will contact the school representative requesting the teacher-approved school supply lists for 2019. March 4, 2019: The teacher-approved school supply lists for 2019 are due to A.Hartz to prepare price quotes. Week of April 1, 2019: The prepared price quotes for each grade level will be sent back to the school representative for approval by him/or her and/or the teachers/principal. April 19, 2019: All final price quotes must be confirmed and all pta fees (if applicable) and website notes (if applicable) must be submitted to A.Hartz. May 3, 2019: All the information on the website must be approved by the school no later than this date in order for online ordering to begin on 5/6. May 6, 2019: The school supply packet flyer that A.Hartz will supply to the school should be distributed to the school community by this date. Online ordering begins today (only if final approval of the website information was given). June 28, 2019: Last day of online ordering.